Toyota is sponsoring the world's first autonomous hydrogen-powered ship on a six-year world tour. 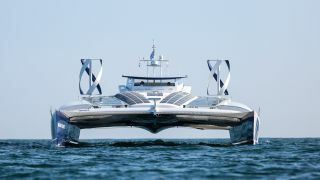 The specially adapted race boat, Energy Observer, uses solar, wind and wave-generated power – as well as carbon-free hydrogen generated from seawater. The base technology already exists for use on land, where it helps overcome the problem of intermittent power supply from renewables, but this is the first time it's been used at sea to produce hydrogen 'live' during stopovers and navigation. The ship creates hydrogen by demineralizing seawater (removing salt and ions), then separating the oxygen and hydrogen through electrolysis. The hydrogen is compressed at 350-700 bar, then stored in tanks ready to be used in the energy stacks when needed. Energy Observer was built in Canada in 1983 by naval architect Nigel Irens, and this latest voyage won't be its first world record. In 1984, it became the first racing sailboat the break the 500-mile limit in 24 hours. The boat has been lengthened four times since its racing days, and is now 30.5m long and 12.8m wide. At 28 metric tons, it has a considerable weight advantage compared to ships powered by storage batteries alone. A team of over 30 people, including architects, designers and engineers, worked to prepare the ship for its six-year voyage, in which it will navigate 50 countries and stop in 101 ports of call. A northern European tour is scheduled for next year, including the UK. The crew aims to reach Tokyo in 2020, in time for the Olympic Games. The ship is captained by professional racer Victorien Erussard, accompanied by leader of exploration Jérôme Delafosse, a deep-sea diver and filmmaker. During their journey, the team will produce documentary content about reliable energy sources. This will be broadcast through an eight-episode series on French TV network Planète+ and as a web series shared on social media. "Energy Observer is a conversion that has a double meaning: to recycle a reliable and lightweight catamaran which is an around the world record holder and to invest in research and development, instead of in composites," says Erussard. Toyota is already using hydrogen to help power vehicles on land, including cars like the Toyota Mirai, as well as buses, trucks and forklifts. Toyota France provided Energy Observer's crew with eight vehicles for use during layovers when the ship set off last year, and now Toyota Motor Europe has put its full support behind the voyage. "Energy Observer is an exciting initiative and we at Toyota Motor Europe are delighted to be associated with such a passionate and dedicated team," says Matt Harrison, vice president of sales and marketing.